Plastic Cup Boyz appears Thursday, Feb. 22 through Saturday, Feb. 24 at Punch Line Philly in Fishtown. 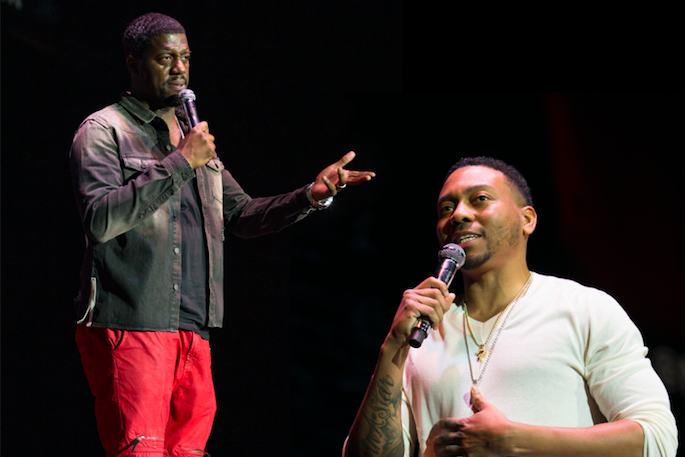 Whether opening for, or performing with Kevin Hart – the Philadelphia stand-up comic-turned-cinematic comedic icon with the Midas touch – Plastic Cup Boyz has its own version of observational humor. Under their microscope, everything from eating at McDonald's to viewing sports on television to childbirth is an excruciating exercise. Football, in particular, was on the mind of Na'im Lynn, the New Jersey-raised part of the Plastic Cup Boyz with Will "Spank" Horton. Lynn chatted before their Philly dates at Punch Line Philly this week – the only solo shows away from Hart during the trio's current tour. Q: Assuming your ties to Kevin Hart run deep as you guys open all of his tour dates and he is an occasional third member of the Boyz. Do you hang when you're not on stage or in the writers' room? A: If we're not working, we're still talking once a week. He's busy with family and film, and I'm busy with work and my daughters. Same with Will [Horton]. If we don't manage to see each other, we're on the phone or hanging out when we do group chats online. We're old friends. That's what they do. Q: It is difficult to capture what the two or the three of you – or even what he does alone – on stage. It is observational and conversational, but in a manner that seems so casual. Curious as to how all of your acts are written or how they come together? A: Joey Wells is Kevin's primary writer. But he and a few other friends are merely punching up stuff. When he's working up new material…that's all him. Same with us. There's structure and free-styling and people throwing a few things here-and-there, but what Kevin does is all his. Q: You lived in New Jersey. Kevin's from Philly. You and Will have been through towns a million times with Hart. What is your vibe regarding the Philly comedy scene? A: Honestly? It is not one of the best areas for it as there really are only two comedy clubs. You'd think a big city like Philly would have multiple comedy clubs. It should. You'd have a much bigger thing going there. if you had a few more rooms you get more comedians nationally and even the locals would get more stage time. Q: That's a very frank answer. How did you get together with Spank in the first place? A: We went to college there and became friends. There was a time right after that where I was also working with Cedric the Entertainer when he was doing some shows with Kevin. I suggested they put Spank on the bill. Kevin really took a liking to him. Q: Going into this upcoming gig in Philly – so far the only solo shows on this tour with Hart where you can break away – what will be on your mind? A: Spank is probably going to talk about the Super Bowl, especially since the city is still on a high. I'm actually mad that the Eagles won. Other than that, I got nothing local. Q: Hang on. Did you wanted New England to win or some other team altogether? A: I was actually anti-football this year because of [Colin] Kaepernick, but I have always been a diehard Cowboys fan. Then again, I was not happy with the Cowboys after seeing Jerry Jones' reaction to protesting the [national] anthem. So, even those guys, I wasn't crazy about. I don't care for the other teams in the NFC East, so I would've been equally upset if the Giants [won]. I dig Tom Brady. He's the GOAT. I definitely wanted the Patriots to win. They didn't though. Maybe next year. Plastic Cup Boyz appears Thursday, Feb. 22 through Saturday, Feb. 24 at Punch Line Philly, 35 E. Laurel St. Tickets are $25. Show times are 7:30 p.m. to 10:15 p.m. throughout the run.